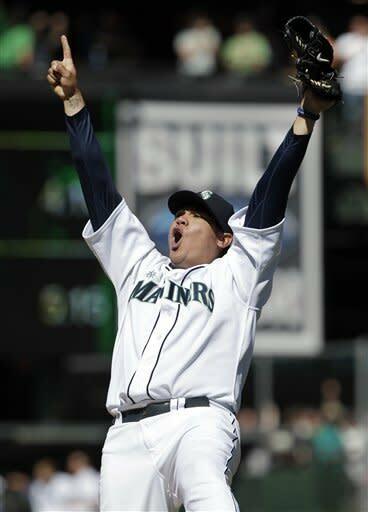 SEATTLE (AP) -- His arms outstretched to the sky, about to be swallowed by anxious teammates who ignored him for most of nine innings, Felix Hernandez had finally done it. Ever since his major league debut as a baby-faced 19-year-old with wild curly hair and a hat that never sat straight, he had chased perfection. Now King Felix had his crowning achievement. No hits, no runs, nobody allowed on base. Hernandez pitched the Seattle Mariners' first perfect game and the 23rd in baseball history, overpowering the Tampa Bay Rays in a brilliant 1-0 victory Wednesday. The 2010 AL Cy Young Award winner has never hid his desire for pitching perfection. For a franchise on its way to an 11th straight season without a playoff appearance, Hernandez is the one constant keeping fans interested in Mariners baseball. He's revered in the Pacific Northwest, not only for his performance on the mound, but for his willingness to stay. When he could have waited and sought a bigger payday elsewhere, Hernandez signed an extension in 2010 that will keep him in Seattle through the 2014 season. So when the ''King's Court'' of yellow-shirted fans in the left-field corner began chanting ''Let's Go Felix!'' to start the eighth inning, it spread through the entire stadium. The crescendo of screams and yells finally reached its pinnacle at 3:02 p.m. PDT when Hernandez threw a called third strike past Sean Rodriguez to ignite the celebration. It was the third perfect game in baseball this season - a first - joining gems by Chicago's Philip Humber against the Mariners in April and San Francisco's Matt Cain versus Houston in June. More than half of all perfectos - 12 - have come in the last 25 seasons. This also was the sixth no-hitter in the majors this season, three of them at Safeco Field. Humber threw his gem in Seattle, then six Mariners pitchers combined to hold the Los Angeles Dodgers hitless at the park on June 8. There have been seven no-hitters in a season twice since 1900. It happened in 1990 and again in 1991, with Nolan Ryan throwing two in those days. For the Rays, it was an all-too-familiar feeling. This was the third time in four seasons they had a perfect game pitched against them, following efforts by Dallas Braden in 2010 and Mark Buehrle in 2009. ''The one thing I've learned is that no-hitters and perfect games don't mean anything about tomorrow, anyway,'' Rays manager Joe Maddon said. Hernandez's dominance got stronger as the game progressed. He cruised for five innings, then pitched through tough at-bats, delay tactics and the mounting pressure of perfection to close out the gem. Hernandez struck out 12, including but eight in the final four innings. He struck out the side in the sixth, did it again in the eighth and hit as high as 95 mph in the ninth. Two starts earlier against the New York Yankees, Hernandez tossed a two-hit shutout, leading Seattle manager Eric Wedge to call it the finest outing he's seen from Hernandez. Suffice to say, Wednesday was better. With one out to go, Rodriguez got ahead 2-0 in the count. After circling the mound, Hernandez took the sign from Jaso and came back with two straight breaking balls for strikes. He ended perfection with a called third strike on his 113th pitch. The 26-year-old Venezuelan right-hander had the Rays swinging over his sharp curve all afternoon, with Evan Longoria, Ben Zobrist and Carlos Pena each striking out in the eighth chasing breaking balls. Tampa Bay seemed to try another technique to disrupt Hernandez, and that also failed. With two outs in the seventh, Maddon came out to argue after plate umpire Rob Drake called strike one on a borderline pitch to Matt Joyce. Maddon stuck around for a minute or so to argue and when he left, Hernandez was still right in rhythm. ''I was yelling at Joe to get ... out of there,'' Wedge said. It was the second no-hitter this season for the Mariners - doubling the franchise's total entering the year - and third total at Safeco Field after the park went more than a dozen years without one. After Humber's perfect game, a six-pack of Seattle pitchers tossed a combined no-hitter against the Dodgers in June. The total of six no-hitters is two shy of the record set in 1884, one short of the total in each of the 1990 and 1991 seasons. Seattle's only run came thanks to Brendan Ryan's aggressive baserunning. He led off the third with his first hit in 10 at-bats against Jeremy Hellickson (7-8), a sharp single to left. He was still at first with two outs when he got a great jump on a curveball that bounced in the dirt and escaped Lobaton. Ryan never hesitated at second and made it all the way to third. He then jogged home when Jesus Montero followed with a single to left. Unlike Cain's perfect game in June, Hernandez didn't need the help of a career-high in strikeouts or spectacular catches. The closest to defensive highlights in this one were Eric Thames running down Sam Fuld's drive to right-center leading off the game and Ryan throwing out B.J. Upton on a grounder into the shortstop hole in the seventh. After Maddon's ejection, Joyce worked the count to 3-2, Hernandez's third and final three-ball count, and hit an inning-ending groundout. A long wait on the bench in the bottom of the seventh didn't hamper Hernandez, who struck out Longoria on a biting breaking ball to start the eighth. With chants of ''Let's Go Felix!'' growing, Hernandez struck out Zobrist. The chant grew in volume as Hernandez got ahead of Pena and closed the inning with another punchout. NOTES: The Mariners now have four no-hitters in club history, three of them individual. Seattle's previous individual no-hitter came when Chris Bosio shut down Boston on April 22, 1993. The other solo effort was thrown by Randy Johnson against Detroit on June 2, 1990. ... Tampa Bay was no-hit for the fifth time in franchise history. ... Maddon's ejection was his second of the season. ... Maddon said the team plans to keep INF Luke Scott on his rehab assignment in the minors through the weekend. Scott has been on the DL with an oblique strain.